The Conference on World Affairs, famously called “the Conference on Everything Conceivable” by Roger Ebert, is held every April at the University of Colorado Boulder campus. The public is invited to witness any of the 200 sessions held by 100 speakers and performers. These thought leaders will be discussing and debating a variety of topics from gender issues, science and technology, environmental and political topics, pop culture and so much more! To get the most out of the conference, I recommend downloading the free Conference on World Affairs app that will help you to find topics of interest, keep track of your schedule and even submit questions for the speakers. Here are a few of the many thought-provoking discussions, performances and presentations that will be happening April 9 – 13, 2018 in Boulder. #1 Danielle Feinberg Lights Up Coco! Danielle Feinberg, Director of Photography (Lighting) for Pixar Animation Studios, will be speaking about how she, and her co-creators, create stories with soul and wonder using math, science and code to create the jaw-dropping worlds of Coco, Brave, Finding Nemo and more. Danielle works with teenage girls to ignite a passion for science and technology and to encourage these young women to pursue a career in Computer Science. She is also a Boulder native. Check out Danielle Feinberg’s TED talk here. Danielle Feinberg’s presentation will be held at Macky Auditorium on Friday, April 13, 2018 from 1PM – 2:20PM. A panel of experts will be discussing how the Earth has been affected by humans by asking the question: Have humans caused a new global epoch? Speakers include David Grinspoon of Planetary Science Institute, Tracey Holloway Professor at University of Wisconsin-Madison and President of Earth Science Women’s Network, Jennifer Thomsen Assistant Professor of Parks, Tourism, and Recreation Management for the University of Montana, and Alexander Verbeek, Dutch Diplomat, Environmentalist and Associate at Stockholm Environment Institute. Earth in Human Hands will be held at the UMC Center Ballroom on Tuesday, April 10, 2018 from 11AM – 12:10PM. Pianist Roman Zavada performs live on stage under imagery and video of the Aurora Borealis in Northern Canada at Fiske Planetarium. From the rock of the Canadian Shield to sitting on the edge of the taiga, Roman Zavada pushed his creative boundaries by getting inspiration from one of the most majestic and grand phenomena on our planet — the northern lights. A colorful immersive show in which Roman Zavada performs live features the piano, resonating strings, and auroras filmed in real time and 360 degrees. A talk will be given by CU Astrophysical and Planetary Sciences researcher, Robert Ergun, on heliospheric and astrophysical plasmas. Resonance Borealis will be held at Fiske Planetarium for two performances on Thursday, at 11AM – 12:15PM and 4:30PM – 5:45PM. Amanda Gorman, the first ever Youth Poet Laureate of the United States of America, has been called the “next great figure of poetry in the US”. She will be speaking at the Conference on World Affairs this year, at Poetry: The Power of the Words of Women. Amanda Gorman is an award-winning published writer, an ambassador for the feminist platform, School of Doodle, as well as a sophomore at Harvard University. Amanda Gorman will be speaking at the Macky Auditorium on Friday, April 13, 2018 from 11AM – 11:50AM. One of CWA’s major events, keynote speaker Tony Seba will present Rethinking the Future: Clean Disruption of Energy and Transportation. Tony Seba is the co-founder of RethinkX, a think tank that forecasts the speed as well as the scale of technology-driven disruption. He is also an author and educator at Stanford University. Keynote: Rethinking the Future: Clean Disruption of Energy and Transportation will be held at Macky Auditorium on Monday, April 9, 2018 from 11:30AM – 12:20PM. A topic that is of great concern to many in Boulder, four speakers will be discussing the different ways to find compassion and creativity to alleviate this nationwide issue. The speakers include: Charles van der Horst, Emeritus Professor of Medicine at University of North Carolina, Rosanne Haggerty, CEO of Community Solutions, Brandon D. Anderson, Founder and CEO of Raheem AI, and Darrick Hamilton, Associate Professor of Economics and Urban Policy at The New School. Homelessness: Attitudes, Beliefs, Solutions will be held at the Boulder Public Library’s Canyon Theater on Monday April 9, 2018 from 4:30PM – 5:45PM. At this presentation, listen to renowned women peacemakers and their inspirational perspectives on paths to disarmament and peace. Speakers include Heather Hurlburt, Director of New Models of Policy Change at New America’s Political Reform Program, Susi Snyder, Nuclear Disarmament Program Manager of Don’t Bank on the Bomb, Margo Squire, a career diplomat and Consultant for Retired Foreign Service Office at the US Department of State and Shadia Marhaban, Journalist, Activist and Peace Mediator at Mediators Beyond Borders International. Women Waging Peace will be held at Macky Auditorium on Thursday, April 12, 2018 at 3:30PM – 4:40PM. Valentino Achak Deng, a Minister of Education for South Sudan, tells his story as a lost boy. The Lost Boys of Sudan were over 40,000 boys of the Nuer and Dinka ethnic groups who were displaced or orphaned during the Second Sudanese Civil War (1987–2005); about 2 million were killed and millions were displaced. In 2006, Valentino Achak Deng and author, Dave Eggers established the Valentino Achak Deng Foundation to help rebuild Sudanese communities by increasing access to educational opportunities. The foundation’s focus is on quality education, vocational training, sustainable development and girls’ education. Despite Deng’s hardships, he maintains an unwavering, positive outlook on South Sudan and believes the solution lies in increased education and knowledge of human rights and improved economic opportunities. Valentino Achak Deng will speak at Macky Auditorium on Wednesday, April 11, 2018 from 3PM – 4:20PM. The Ebert Interruptus series is one of the most beloved and popular Conference on World Affairs traditions: a four-part event showcasing a film along with in-depth analysis over 3 sessions. The host of this year’s Ebert Interruptus will be film critic Josh Larsen, who will break down and discuss Mad Max: Fury Road. The film is a post-apocalyptic action adventure (the first action film for Ebert Interruptus). To be clear, the first showing will simply be a showing of the film itself, while the following three events will be a viewing of the film, interrupted shot-by-shot for discussion and analysis. Ebert Interruptus Schedule (all events held at the Visual Arts Complex): Ebert Uninterruptus: Mad Max Fury Road showing on Monday April 9,2018 from 3:30PM – 5PM; Ebert Interruptus I will be held on Tuesday, April 10, 2018 from 3:30 – 5PM; Ebert Interruptus II will be held on Wednesday, April 11, 2018 from 5PM – 7PM; Ebert Interruptus III will be held on Thursday, April 11, 2018 from 3:30 – 5PM. In Coal to Code: Retraining Tomorrow’s Workforce, speakers will discuss the future of career and industry in America. Speakers include Jim Deters, CEO of Colorado-based Galvanize, Tulio Cardozo, Technical Manager at The Last Mile Works, and Larry Greenwood, Jr., President at Japan Society of Northern California. Coal to Code: Retraining Tomorrow’s Workforce will be held at the UMC West Ballroom on Friday, April 13, 2018 from 9AM – 10:20AM. 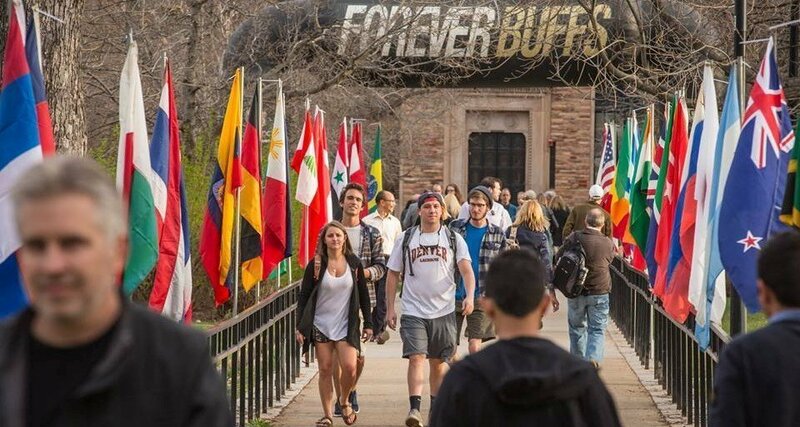 The above are just 10 of the 200 events happening all over the CU Boulder campus at this unique festival of thought. To see the full schedule for CWA Week 2018, click here.